The view from where I live, looking roughly north. 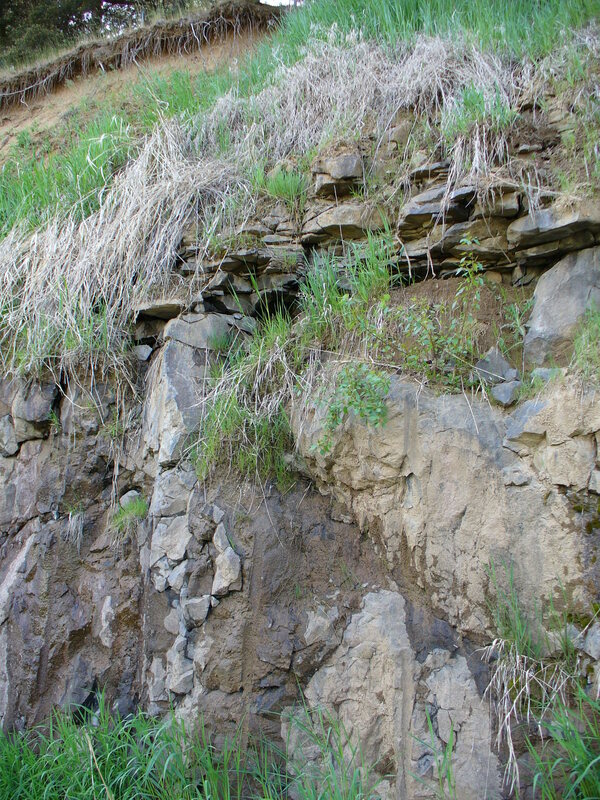 I live on a bluff. Opposite are the buildings owned by the company where I work. In this photo, you can see the route I take each weekday morning on my way to work. In the valley is a little creek. 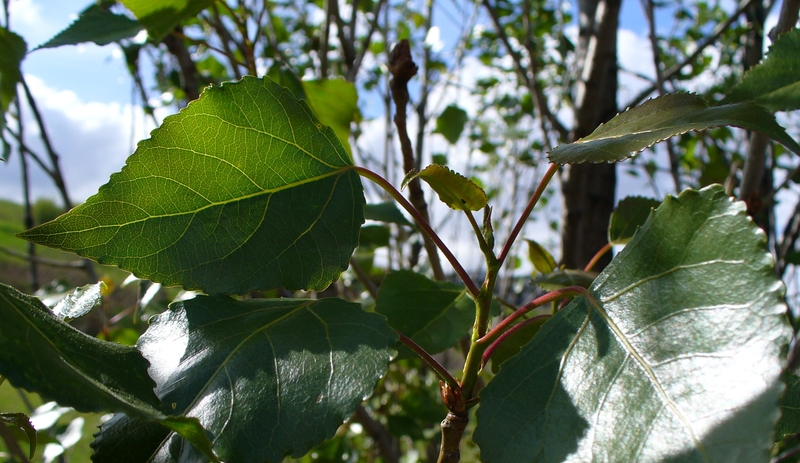 It is one of the few protected areas in this region. On the communications tower live two hawks; their domain is inhabited by rabbits, geese, ducks, a variety of other birds, snakes, and at least one coyote (I’ve seen it). On another day I may go with my camera down there – there is a bike/exercise path that goes through – and take some photos for you. This weekend marked the grand opening of a totally renovated Church of Scientology building in Portland. I helped a bit on its “files project,” as I did at Seattle while its building was being renovated. I would have liked to go, but the time and expense involved in getting there was more than I could confront. That does not mean the occasion was not momentous. In the grand scheme of things, our churches do very important work. I doubt it will ever be officially recognized. So I stayed home and worked on setting up my work area. Below is what it looks like so far. I don’t need it excessively fancy. Part of my experiment now is to re-purpose mass-manufactured electronic goods for personal use, and some of the results of that experiment are illustrated in this photo. As I have mentioned previously, we have an amazing thrift shop in Pullman (Palouse Treasures) not far from where I live, and it has helped me to stock my work bench with power supplies, tools, and organizing bins. Though I do miss re-PC and the huge Goodwill Outlet in Seattle, Palouse Treasures always has something interesting for the discerning shopper! My electronics work bench, as of this date. Idaho is only about 6 miles from Pullman, so it wasn’t that long a trip! The area was experiencing an inversion. Warm air pushing down from the east. Temperatures around 80°F and dry. I couldn’t resist going out for a bike ride. I didn’t pack water because I didn’t think I would stay out long. But after an interesting visit to Palouse Treasures thrift shop, I set out to see if the North end of the Pullman bike trail connected to the Chipman Trail. And sure enough, it did! So I went out on it. My basic purpose after getting under way was to reach someplace where I could get some water. This happened just across the Idaho border, at the Moscow (weird name for a Western town!) Walmart. That’s about six miles out on the trail; I skipped the last mile and came back. There were quite a few people using the trail. A few walkers and runners. A lot of bikers. And a group of student-age people riding bikes, skateboards, roller skates (a church group?). The trail follows the creek, so is somewhat scenic, unlike much of the surrounding area, except on a grand scale (the rolling hills). If you slow down and watch you’ll see lots of birds. And a few butterflies and insects were out. The ride “up” to Idaho is indeed uphill (though very slight gradient – maybe 100 feet in 7 miles) but was also against the odd east wind. But as I glided back down towards Pullman I thought: What a joy this is! The greenery, the birds, the rustling grass. The sun twinkling in the moving water of the creek. What a simple pleasure! I wish everyone on the planet could enjoy such things! 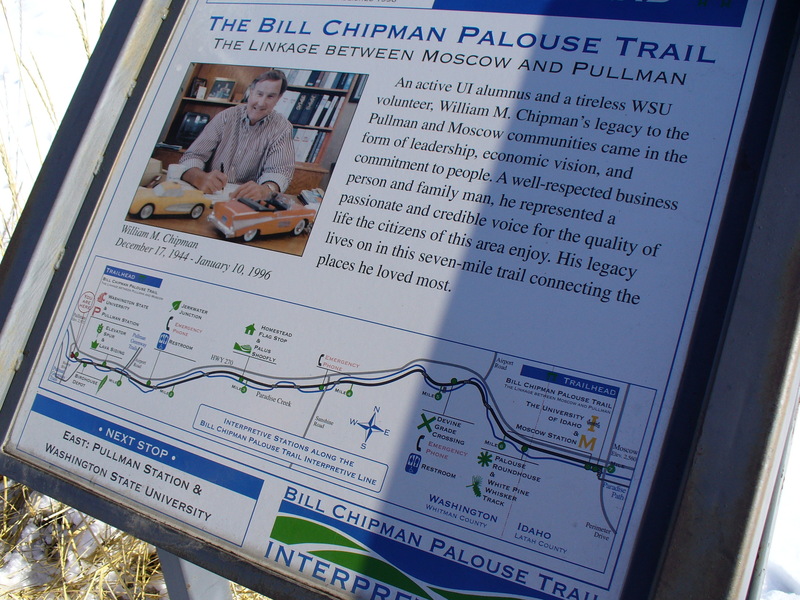 Info sign at Pullman entrance to the Chipman Trail.